Arguably the most famous Russian film is Ironiya Sud’by, “The Irony of Fate”. It’s tradition to watch it every New Year’s Eve—those who’ve been reading for a few years may recall that I watched it on NYE when I was living here. It’s a very, very Russian story. Basically, it’s set during Communist times, when everybody lived in the same type of flat, with the same type of furniture, on look-alike streets. So this chap Zhenya Lukashin gets drunk at the banya with his buddies one night in Moscow, passes out, winds up on a plane thanks to some would-be helpful friends, and the next thing you know, he’s in Leningrad (St P). He eventually wakes up in a state of confusion, and drunkenly catches a taxi, giving his home address. That address also happens to exist in Leningrad, and the block of flats looks exactly the same, so wonders on in to ‘his’ home, where disasters abound. It’s just the most Russian. Anyway, one of my friends did something vaguely akin to this on Saturday night. We had planned to go out, but instead he found himself inebriated and booking a train to St Petersburg. By the time he realised (ie when I texted him asking when and where to meet him), it was too late—he was already well on his way. But don’t you worry, I still arranged myself a thoroughly random Moscow night out. I’m getting ahead of myself though, so quick recap—Saturday morning I took the free walking tour, as it had been a couple of years since I’d been to Moscow, and I wanted to reorient myself. I then went for some food and a browse through a bookstore on Tverskaya, but wasn’t actually feeling very well, so went back to the hostel for some drugs and naps. It was shortly after waking up that I discovered out that my friend Hoos had pulled a Zhenya. Anyway, Hoos offered to get his friends to take me out, but they were… remarkably unresponsive (as it turned out, the guy in question’s phone battery ran out). So I went for Japanese at Dve Palochki (I’ve said it before, I’ll say it again—Japanese food in Russia is so good!!!) and considered my options. Naturally, my first step was to turn to Reddit. I posted to the Moscow sub, asking what I should do with my evening. However, the sub didn’t seem that active, and I’d heard that Couchsurfing (CS) was pretty big in Moscow, so I decided to check it out. I’d never actually used Couchsurfing before other than to advertise a room (when I was living in St P) and to give other people references. Nonetheless I eventually figured my way around (phone in one hand, chop-sticks in the other), and saw some guy had posted on the Moscow group asking if anyone was keen for a night out. Perfect! This guy, who we’re going to call Jensen (partly because I didn’t ask permission to use his name, and partly because he looks remarkably like the actor Jensen Ackles—side note, I realised on the train to St P that I actually spent all weekend with incredibly good-looking and intelligent men), was a Finnish guy in town for work. I sent him a message via CS with my Russian number, and heard from him pretty quickly. Then—to adventures! Jensen told me he’d meet me at the exit to Kitay Gorod metro station, which was near where I was staying. He arrived and said that he was near a ‘coffee house’ and a church. Now, for those who don’t know, these are probably the two most common things in Russia. Also, as it turns out, there are about a zillion exits to K-G. So I checked all of them. Eventually I found him by the statue of Cyril and Methodius, the monks who decided the Cyrillic alphabet was a good idea (I agree), and he was a thoroughly normal human being—see? Internet strangers aren’t so scary :p.
Anyway, this just so happened to have been the start of the walking tour, and so we went for a stroll, me recounting some of the tour highlights as we went. We walked up to and through Red Square, stopping by the front of the history museum (my favourite night-time Moscow sight to date), and seeing some kind of amazing fairy-tale show projected onto Moscow Manege. 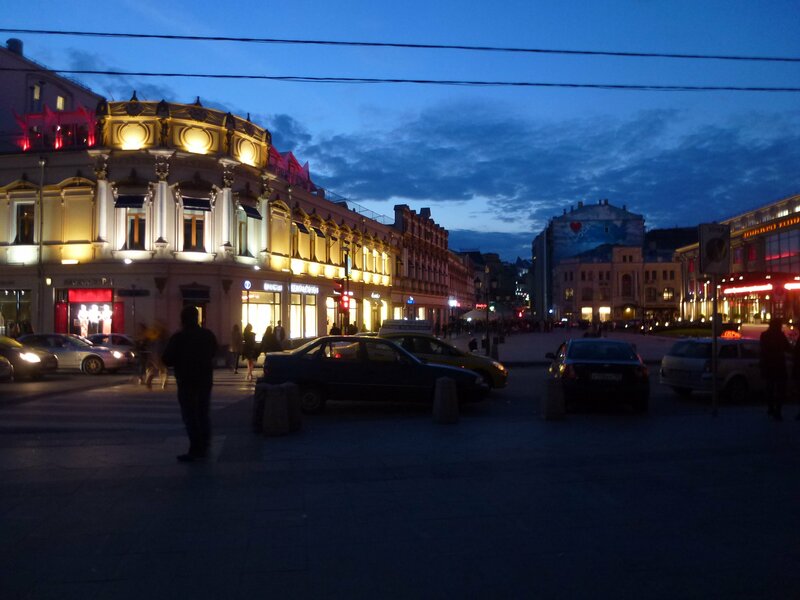 From there we walked for a few more blocks, finding ourselves on Arbat Street. And we hadn’t found a bar yet (apparently we’re blind). Part of the display being projected onto the Manege. We went walking up Arbat, and eventually found an Irish pub. So yes, an Australian and a Finn went to an Irish pub in Russia. Why not? 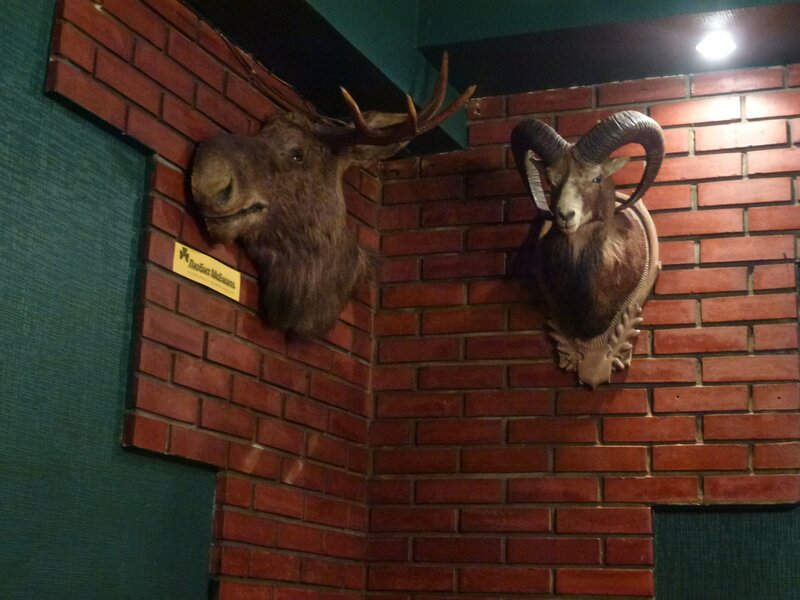 We ordered cocktails, and were eyed off (one eye only) by half a moose head. We wondered where the other half was. Next we went in search of another bar, but are apparently just awful at finding them. So we checked out my Reddit thread, as by this time, a few Muscovites had written suggestions for bars and clubs. We looked at the various locations and settled on one, enticingly called ‘Hidden Bar’. We’d done enough walking, so jumped in a taxi with an extremely friendly Georgian man. I was in the back seat, and I remember at one point he was telling Jensen how there are ‘so many beautiful women’ in Moscow, but you have to be very, very rich ‘to get a good one’. We made it to Hidden Bar, which was one of the least hidden bars I’ve ever encountered. Other than the random address, that is. I mean, there were seriously big signs and arrows all saying ‘Hidden Bar’ and pointing straight at it! So we went on in, had another cocktail, and I completely failed at communicating in any way thanks to the music volume. I tried though. I tried my little heart out. Anyway, it was 3:30 and starting to get light (featured image), so we called it a night. He disappeared into a taxi, and I (after taking a photo of a map on his phone) wandered off into the night. I stopped and asked directions a couple of times, but wasn’t actually that far from my hostel, so was back by 4am. With the, worst, blisters. Haha my shoes are full of blood, it’s pretty impressive. But that’s fine—and what’s more, when I got back, I discovered that I had the room to myself! I exclaimed as much to the lady on the desk, and she said that she was going to check a guy into my room, but then she saw I had it all to myself, so figured she’d leave me like that. Best logic ever?? But yes, that was my internet-led night. I’m calling it a win.